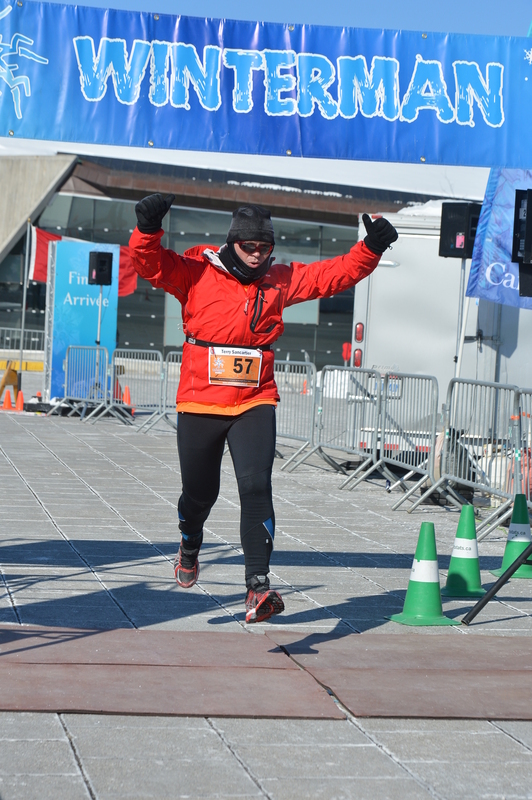 Last year, after completing the Winterman Marathon on February 17th 2013 in -29 temperatures with the wind chill, I promised myself that I would find a warmer climate in which to run during that time of year. I was eyeing the Miami marathon. Actually I’ve been eyeing Miami for a few years now. But my finances usually hold me back because there are other trips planned down the road. I have to make choices unfortunately. I love to travel and if money were no object I’d be writing a race report about Miami right now. In the late summer of 2013, it became apparent rather quickly that I wouldn’t be flying to Miami to run the marathon. I registered for the Winterman Marathon race on the last day of 2013. Winter has been brutal this year. Extreme cold, wind and plenty of snow made for a challenging training season so far. The week before the race, I start my usual ritual of checking the weather. The temperatures are moving up to the single digit minuses – encouraging. I pick up my race kit on Saturday the 15th at the War Museum. The weather is perfect; mild and sunny. I even have a quick conversation about it with other runners in the parking lot. “It’s only going to be slightly colder tomorrow than today” one said. I nod in agreement. At home, I get my things ready for the next day. I check the weather forecast to help me determine how many layers to wear. My jaw drops when I see what’s in store. The mercury is going down and the winds are increasing to produce a -28 degrees Celsius (with wind chill) temperature at race start. Great! Part of me is thinking, “Why do I do this to myself?! Again!” But to be honest, I love a good challenge. On the kitchen table, I place: my running jacket, 2 long sleeve shirts, 2 pairs of winter running tights, 2 pairs of socks, 3 pairs of gloves, a balaclava, a polar fleece hat, 2 neck gators, sunglasses and my race number holder belt. Later on, I decide to throw in another thin jacket to the mix. I’m ready for race morning. In bed I remember that I forgot to put some nutrition gels in my jacket packets. I don’t get up. “I’ll remember tomorrow morning” I think to myself. Race morning, I eat and get dressed. We leave the house. Gen drops me off at the War Museum where the race starts. I walk in the museum and immediately see Patrick and Shauna, two of my good running friends. Shauna I met the very first year I started running. We trained for our very first marathon together in a run clinic. Pat I met the following year as I was training for my third marathon. I pick up my timing chip in the main hall where all the military equipment is on display. For this race, the chips are on a Velcro strip that we attach to our ankle. As I’m talking to Shauna and Pat, I realise that I forgot my gels. In all my years of running I’ve never done that. How could I forget to bring gels for a marathon distance? 42.2 kilometres is a long way to run without some form of nutrition. Luckily Pat, the generous guy that he is, gives me two. I hesitate at first. I want to make sure he’s ok before I accept. He insists that he’s fine. Pat would give you the shirt off his back. It’s time to head outside. It’s race time. Pat and I are running the marathon and Shauna is running the half. The start times are the same for everyone and so we can all start together. We line up outside near the museum entrance. It doesn’t feel as cold as it was the year before but then again, maybe I’m trying to convince myself of that. A voice is heard counting down and so we all join in. 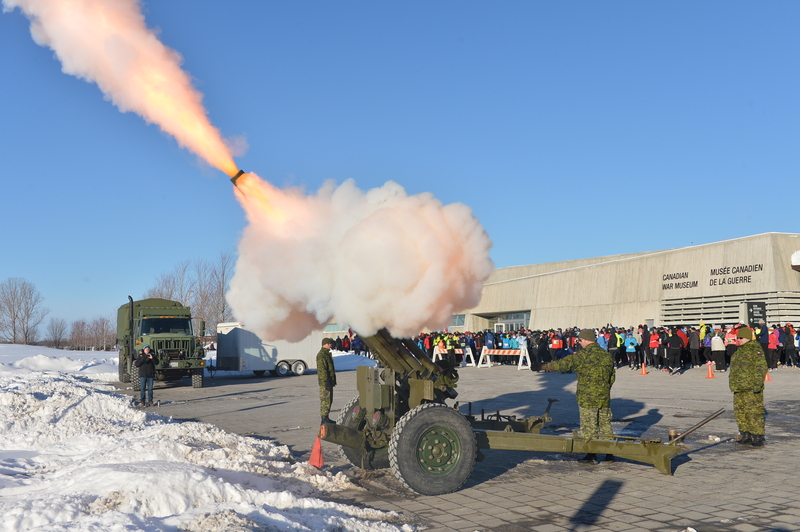 The Howitzer goes off a fraction of a second after the vocal signal is given and we collectively jump in reaction to the loud noise. It’s time to run! It’s crowded but it will thin out as we progress. The 5 k, 10k , 21.1 and marathon runners all start together. It’s a looped course. Pat and I have 8 loops of 5.275 km to run. Shauna goes around 4 times. All three of us start together. Having not seen Shauna in some time, we catch up – there’s no shortage of things to talk about. I run two loops with Shauna, I let her go at the start of the third loop as she’s aiming a 1:45. My plan is to go slower. I’ve turned down the “race switch”. I’m treating this marathon as an extra long training run but with the goal of keeping under 4 hours. I stop briefly because I can’t reach into my inside jacket pocket to grab my gel while running. I find the gel and look behind me to see if I can find Pat. That’s when my friend Brian comes out from a small crowd to see me. I ask him if he has seen Pat. “He’s about 1 to 1 ½ minutes behind you”. I thank him and start running again. “Six more loops to go” I say to myself as I head out into the headwind again. I sense a faint feeling of unease. “What’s this?” I think to myself. No matter how many of these races I’ve done, there’s always that element of the unknown. It’s a big question mark as to how things are going to go. I put in the training and the hard work. The rest is up to chance and mental determination. I dismiss the thought and press on. I’m just over ten kilometres into the run. The wind is stronger on this loop than it was on the previous two. This is my fifth time running this race and there’s always a head wind on the way out. The entire course is on the westbound lane of the John A MacDonald Parkway that runs along the Ottawa River which explains the ever presence of wind. The course is not flat; there are two rolling hills. The only flat part is the area around the museum. The more loops I run, the less runners are left on the course. The volunteers are great. It’s cold and windy and yet they’re smiling and cheering for us. They are posted here and there to direct flow and at the water stations. At every loop, near the turnaround point water station, there’s a woman holding up two water cups and yelling “water!” I say “Gatorade” and the guy behind her hands me a Gatorade. Her reply is always “Ah – nobody wants water! ?” My reply is “Not yet”. The official photographers are set up almost half way along the route. At one point I tell them that they deserve a medal for working in this cold weather. They are quick to reply that I deserve one for my endurance. On the third or fourth loop, I spread my arms out and smile for the camera. The photographer is happy and so I make a point of doing something different each time I pass by. It will make for some interesting photos. There’s a woman at the corner of the parkway and Vimy Place near the museum. She’s holding up a sign and cheering for all the runners. At one point I tell her that what she is doing it great. She is happy to hear it. She stays in the cold and wind for close to 4 hours. There’s a volunteer directing flow as we turn on to Vimy Place. He’s always smiling, cheering and high fiving us. With each loop I run I say how many I have left to go. He always replies with something encouraging. We could not run without people like these who volunteer their time to make events like these a success. There a few things on my mind as I run. One of them has to do with recent news: Gen has found out just a few days before that someone she knows well has cancer. The chances of this person surviving are very good. Still, the news is hard to take. The wind is getting stronger. Luckily what I’m wearing is perfect. I’m neither cold nor am I overdressed. It’s always difficult to gauge especially when there’s wind involved. Every time Pat and I see each other, we high five each other. I say things like “We’ve got this!”. I also cheer on other marathon runners with a wave or a thumbs up. I don’t run with music as I like to hear what’s going on around me. It also allows me to interact with others. I play my own music inside my head. Sometimes the siltiest songs come to mind. My pace slows as I get closer to the last loop. I am not running as fast as I had hoped. I have a slight pain in my left foot. It’s been there since kilometre 10. It never gets worse but I am careful. It’s my last loop and as I always do, I thank the volunteers and the photographers. I look for Gen’s Prius in the opposite lane that is open to vehicle traffic. I don’ see her car. She’ll be picking me up after the race. I am pleased to see her near the finish line. I tell her I love her and cross the finish line shortly after. Marathon #28 done! They take off my timing chip and I get my race medal. I find out later that I came in second in my age group. I’m happy about that. My time? I go over 4 hours. Not my best. Actually it’s among my personal worst times. The focus was not on speed but on completing it “comfortably” – if there is such a thing. I have three more marathons to run before I head off to Africa in June. I can’t race them all. Gen and I stay a while longer to see Pat come in. I give him a congratulatory hug. Next up: Around the Bay Road Race 30k in Hamilton in March – the oldest road race in North America and the Rotterdam Marathon in April. 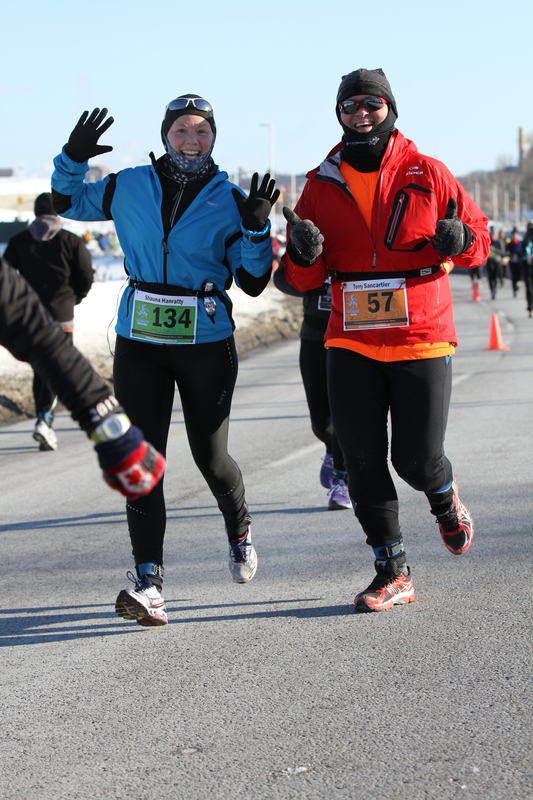 This entry was posted in Uncategorized and tagged Love4Gambia, Marathon, Ottawa, race, running, winter, Winterman. Bookmark the permalink.